Suthers Law Firm is investigating cases of patients who were forced to undergo revision surgery due to defects associated with the DePuy Synthes elbow implant. The DePuy elbow implant components have been recalled from the global market out of concern that the radial stem could loosen at the stem-bone interface following implantation. At the time of the recall, more than 50,000 of the elbow implants had been manufactured and distributed by DePuy. 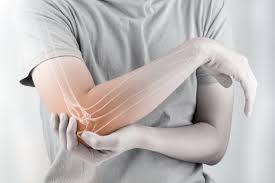 There are multiple conditions that can cause elbow pain and disability which lead patients and their doctors to consider elbow joint replacement surgery. Rheumatoid arthritis, degenerative joint disease, post-traumatic arthritis, severe fractures, and instability are the most common conditions that lead to elbow replacement. Often times, the outcomes following an elbow replacement are good. However, this has not been the case for many of those individuals implanted with the DePuy Synthes Elbow.